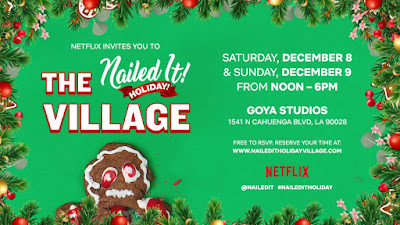 "Netflix is excited to announce the Nailed It! Holiday Village taking place in Hollywood on December 8th and 9th! Visitors will have an opportunity to enjoy ice skating, holiday baked good decorating and other fun activities! To RSVP for this free event, please choose your date and time from the link above. Event details and parking information will be sent to you after your registration. For guaranteed entry, please attend during your registered time frame. Unregistered guests will be directed to a standby line and admitted at first availability." Have A Merry Godzilla Christmas, LA!